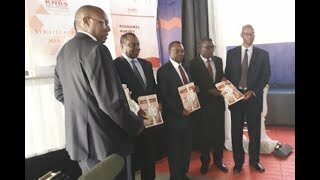 KTN News Apr 25,2019View More on BusinessKenya’s economy posted a significant growth of 6.3 percent in 2018 on a backbone of high growth in agriculture, transport and manufacturing sectors, the Economic Survey 2019 shows. This is a marked improvement from the 4.9 percent economic growth recorded in 2017 when Kenya held a hotly-contested General Election. Kenya National Bureau of Statistics Director-General Zachary Mwangi said the vibrant service sectors also contributed to the growth of the economy. The transport sector expanded by 8.8 percent while food and accommodation sector improved by 16.6 percent. The survey released on Thursday shows Agriculture, Forestry and Fishing sector had the highest growth with 6.4 percent. This is a marked improvement from the 4.9 percent economic growth recorded in 2017 when Kenya held a hotly-contested General Election. The survey released on Thursday shows Agriculture, Forestry and Fishing sector had the highest growth with 6.4 percent. The transport sector expanded by 8.8 percent while food and accommodation sector improved by 16.6 percent. Kenya, East Africa's richest economy, is one of the fastest growing areas on the continent but its performance is often hit by drought. Violence after a December 2007 presidential election and disputes over the following two polls led some investors to scale back investment, hurting growth. Missed revenue targets, rising public debt and uncontrolled expenditure have also emerged as concerns for investors in recent years. The World Bank trimmed its 2019 economic growth forecast for Kenya to 5.7 percent from an earlier forecast of 5.8 percent due to a delayed onset of the main rain season. The government expects the economy to grow by 6.3 percent in 2019, President Uhuru Kenyatta said earlier this month. Two in every 10 Kenyans addicted to drugs – NacadaThe National Campaign Against Drug Abuse (Nacada) has expressed concern over the rising number of Kenyans suffering from drug addiction. Nacada CEO Victor Okioma yesterday said the menace has remained high despite intensified awareness campaigns across the country. “We have established through our national survey that 23.3 percent of Kenyans have a big problem of drug abuse and addiction. He said Nacada is using the surveys to evaluate its performance in the fight against drug abuse. Githiri said rising cases of murder and suicide in the country have been linked to drug abuse and addiction. SUMMARY A good number of smartphone users in Africa can attest to the fact that mobile data is not always cheap For those streaming or downloading huge files, mobile data can be very costlyA good number of smartphone users in Africa can attest to the fact that mobile data is not always cheap. In a survey done by the Cable.co.uk, a UK-based price comparison website, mobile data hugely varies across different countries. ​The report which was done between 23 October and 28 November in 2018, analyzed the cost of 1GB of mobile data in 230 countries. Out of the 230 countries, Africa had three countries topping with the most expensive mobile data. Here are the top ten countries in Africa with the most expensive mobile data for 1GB;1. By IBRAHIM ORUKOMore by this AuthorThe government has clarified that the Huduma Namba listing will not be disrupted despite the National Assembly voting to debar the French firm that is providing the infrastructure from operating in Kenya. NO EXISTING CONTRACT“The ICT Ministry wishes to clarify that the ongoing Huduma Namba registration process will not be disrupted by the decision of National Assembly. We encourage all Kenyans and foreign nationals residing in the country to present themselves for Huduma Namba biometric registration at their nearest centre,” Mr Mucheru said. Therefore, the directions by the National Assembly do not affect Huduma Namba in any way,” he said. Huduma Namba is a programme of the government that seeks to create and manage a central master bio-data register by capturing the biometric data of all citizens and foreigners’ resident in Kenya for enhanced access service delivery. Four-time Olympic champion Mo Farah and Haile Gebrselassie are involved in a dispute over an alleged theft at a hotel belonging to the Ethiopian athletics great in Addis Ababa. The Briton said he had money, a watch and two phones taken from his room, and that Gebrselassie did not help him. Gebrselassie, 46, responded by accusing Farah of "blackmail" and "defaming" his reputation and business.Farah made the claims at the media preview event of Sunday's London Marathon. Gebrselasie accuses Farah of 'disgraceful conduct'Farah alleged that the items were stolen on 23 March. In a statement sent to BBC Sport via his agent, double Olympic 10,000m champion Gebrselassie said he was considering taking legal action against Farah. Ever since Nairobi Governor Mike Sonko came to the spotlight, he has constantly shocked us with his fashion sense. From wearing gold rings and chains to matching his clothes with sunglasses, we have seen different sides of him. Now, Sonko has yet again made Kenyans talk and this time it's about a gold Versace brooch lapel pin. He was spotted with the shiny pin at the Senate committee on Wednesday where he was defending his decision of not appointing a deputy governor for the last 15 months. 'Fake news' detection tool that rates websites on trustworthiness launches in UK[Image, Courtesy]A fake news detection tool that rates websites on their trustworthiness has launched in the UK.NewsGuard which can be downloaded to a web browser or used on mobile phones through Microsoft's Edge browser, uses human teams of journalists and analysts to assess and rate the credibility of news sites. It then awards them a green or red "nutrition label" as guidance for users, which is displayed alongside links to the site in search engines and on social media. The free tool rates websites based on nine criteria, including whether a site repeatedly publishes false content, regularly corrects or clarifies errors, handles the difference between news and opinion responsibly, clearly labels advertising, and declares its ownership details. Internet and social media companies have faced increased pressure from the Government about their need to better police fake news. Register to advertise your products & services on our classifieds website Digger.co.ke and enjoy one month subscription free of charge and 3 free ads on the Standard newspaper. Ex NLC chair Mohammad Swazuri will stay for one more week in remand custody awaiting the high court ruling on whether his bail will be reviewed. The DPP has opposed the review of bail on grounds that the Magistrate exercised his jurisdiction fairly and objectively. Swazuri insists that the bail terms of the Sh12 million issued were unreasonably very high. Early in the week, Swazuri was released on Sh12 million cash bail or alternative bond of Sh30 million. The former NLC chair was arrested over allegations of irregular land compensation. By BBC SPORTMore by this AuthorManchester United midfielder Paul Pogba has been named in the PFA Team of the Year 2018-19 - the only player not from either Manchester City or Liverpool. But there is no room for Liverpool's Mohamed Salah or Arsenal's Pierre-Emerick Aubameyang, who have both scored 19 league goals this season. Tottenham's Harry Kane and Chelsea's Eden Hazard, with 17 and 16 Premier League goals respectively, also miss out. The PFA Team of the Year was voted for by members of the Professional Footballers' Association. It is the second successive year where Manchester City have provided the most players from one team as they had five of the 11 in the 2017-18 side. A cyclone in March hit Mozambique leaving in its wake almost a 1,000 people dead and a devastated infrastructure. On Wednesday afternoon, the storm was 450km from Mtwara but travelling at dizzying speed towards Tanzania. The order to close schools and workplaces was issued on Wednesday by Mtwara Regional Commissioner Gelasius Byakanwa. By THE CITIZENMore by this AuthorTanzanians in Mtwara region on Thursday were scrambling to leave with Cyclone Kenneth set to make landfall tonight. “If this depression becomes the next organised tropical cyclone in the South-West Indian Ocean, it would be given the name Kenneth,” said AccuWeather. President Kenyatta was hosted by the Moi family at Kabarak on Monday. At the time, Mr Moi’s family spokesman Lee Njiru confirmed that DP Ruto had visited but did not see the 94-year-old as he was with his doctors. DP Ruto and Senator Moi are both eyeing the presidency and have fought for control of the Rift Valley votes to use as their base. Mr Ruto described Jonathan as his friend and a humble and hard-working man. He asked Kenyans to continue praying with the Moi family. By NDUNGU GACHANEMore by this AuthorIn an act of defiance, 11 bishops from the Mt Kenya region will host Deputy President William Ruto in Murang’a on Saturday. The bishops have organised an interdenominational prayer rally in which Dr Ruto is expected to lead nearly 150 leaders for the prayer rally in Kenol, Murang’a County. Bishop Maina said the prayers will focus on national cohesion and integration and praying for Dr Ruto who has been under “undue criticism and opposition” from some quarters. Kiharu MP Ndindi Nyoro, a close ally of Dr Ruto, confirmed his attendance. But Bishop Maina claimed to have talked to Dr Ruto himself and that his men had visited Kimorori grounds where the rally would be held, saying there were no doubts Dr Ruto would be there.